Driving north on Mockingbird. The Marine base glows in the distance. Photographer Ben Gould. The Copper Mountain Mesa Community Center had its second movie night Saturday. 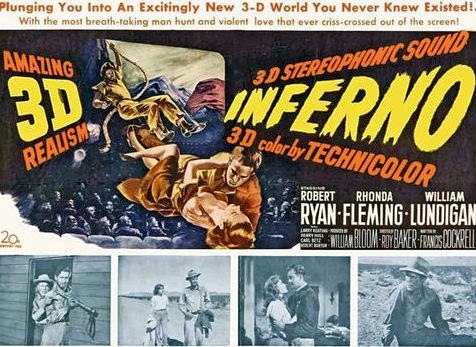 The movie was the Inferno, from 1953. Mary Helen and Steve Tuttle, the backbones of the Center, were away so everything fell on the shoulders of the volunteers – me, Ken, Kip, Annelies, Suzy and Patrick. Ken worked the kitchen with Annelies and I worked the snack bar, mostly by myself. Suzy worked the thrift store. Kip worked the projector and Patrick picked up the slack. Everyone came at once. The gourmet hotdogs with potato salad and watermelon were a big hit at $2.00. Mary Helen made zucchini and lemon muffins which we sold for $1.00 each. There was popcorn with homemade garlic butter, and Halloween boxes of movie candies. When the movie started I was watching the front by my lonesome. At one point I turned and saw a tarantula on the wall, which was very exciting as it was my first sighting. It was about three inches long and looked like it was made of black pipe cleaners. 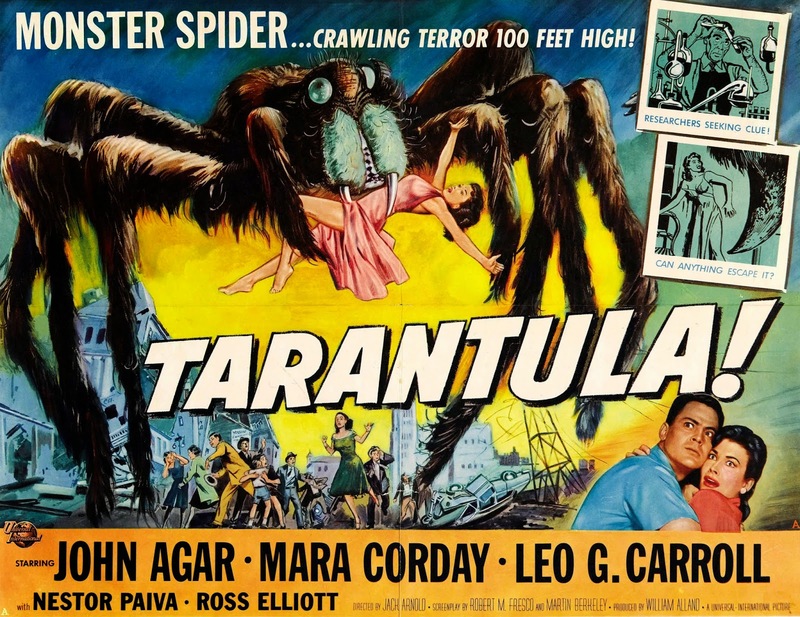 It was fortuitous as next month’s movie is Tarantula and I had a giant spider I bought at Home Depot sitting on the table. I was sitting at the front of the patio alone. A group of about three little brown bats must have seen the spider. They kept flying in, looping past it, and sizing it up. I put on my hat. It was desert dramatic and passed the time as I waited for the movie to end. James and Ben, two friends from Los Angeles, visited this weekend. 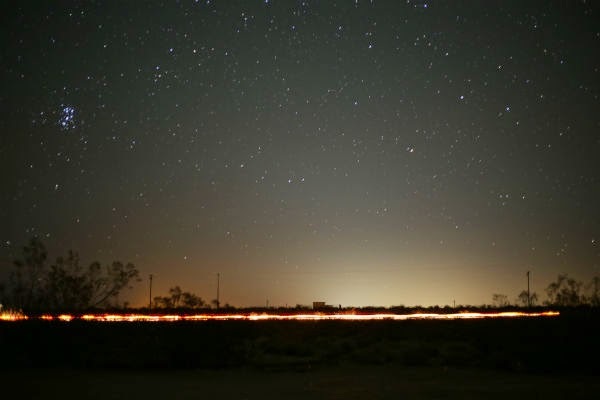 They walked across the BLM land to get to the Center and braved walking back the same way in the dark. It was only two blocks but it was a moonless night and we hadn’t left any lights on at the cabin so at one point, when they felt most lost, they were actually standing right by the house. 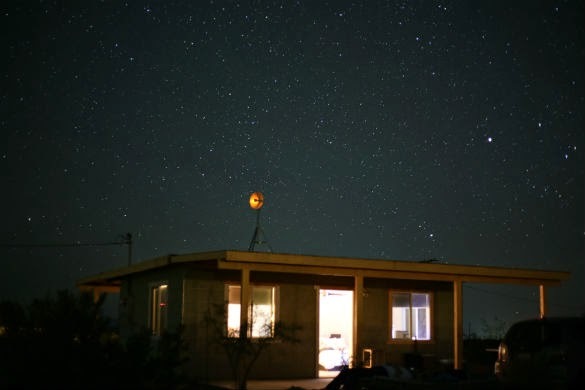 The cabin at night. Photographed by Ben Gould. Ben took some amazing photos of the house and the cabin and other wonders and I’ll post some of these as he sends them to me. I asked about the camera and when I looked it up on Amazon in the morning was dismayed to find it cost more than some of my friends spent on their properties last month. I tried to console myself with a little pep talk about my natural sense of composition and that maybe I’m more of a photo journalist than an art photographer. I thought of going back to a brownie, or pinhole photography. There are options. But when you see these photographs I think you’ll agree that they are quite spectacular. It’s not all the camera, Ben has a great eye and proper skill, but a righteous tool doesn’t hurt. On Sunday morning our neighbors Denise and Mike Myers dropped by and I helped her with her online marketing. She does psychic readings and even though I’m not much of a believer I’ve been helping design and market her website at angelreader.guru. I’m also doing the Copper Mountain Mesa website at coppermountainmesa.org. After that we all piled into cars and drove to pick up Patrick for breakfast at the Palms. Patrick lives near Surprise Springs – where people used to get their water before the city put water lines in. The turkey buzzards were migrating and the sky was filled with what looked like a dust devil of them swirling around the mesa. Ben took photos and James picked up some feathers. 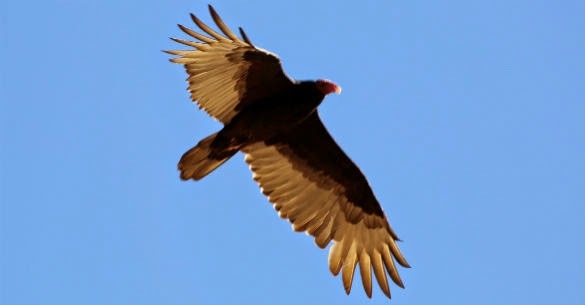 Turkey buzzard on migration. Photographed by Ben Gould. The Palms was wonderful as always. Laurel and Frank were there from the Glass Outhouse Gallery; Molly Katelbach from Radio Free Joshua Tree; Almut and Jill were busy working on a campaign to prevent a new tax hike in our portion of Wonder Valley. At first it didn’t sound like much – about $4.00 a month, but there are a lot of people out here living on the margins and $4.00 is not just one latte less a month, but a chunk of their food or gas money and that little chunk just keeps getting chipped away at. Breakfast was delicious as usual and it’s always a delight to see Mary, Laura, Jimmy Sibley and little Punkin. We stopped by the new Wonder Valley property and gave our guests the nickel tour. Then we drove to Laura Sibley’s new cabin and labyrinth and Patrick and James walked it while the Ken, Ben and I rested in the shade. When Ken and I returned to our cabin on the Mesa we fell into a deep sleep. We’re both very social introverts and there’s a point at which we cannot take any more conversation and we had reached our limit for the day. When we woke we sat on the edge of the patio and looked at the mountains in the distance.